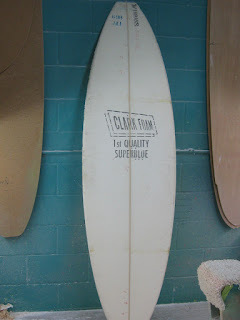 Rummaging around the Lucke Surfboard Factory, I discovered a trove of old Clark Foam blanks and couldn’t resist shaping one. With extra thickness and extra width, the Clark 6-9R “Super Blue” density blank was designed with the larger surfer in mind. (Follow this link if you’re a surf-design geek and want to knnow the blank specs). The blank was perfect for a 6-8 “Big Boy” thruster, and Ray said “go for it”, so go for it I did. More rummaging produced a suitable template from Ray’s collection, and with some subtle modifications this is what I came up with. The board has a full outline which will help the “larger” rider in our typical California conditions, but thickness was kept at 2-5/8″ to reduce corkiness. Standard single-to-double concave with slight “V” out the tail. Dims 13″ x 20-1/2 x 15″. Ray is planning on doing this one in a light-yellow resin tint, deck and bottom with red pinline on deck. It’ll look sick with red fins. If you’ve been looking for something like this, shoot Ray an email at raylucke@gmail.com. Not too late to make a color request!